The most significant number about this Outlander isn’t the seats (7), doors (4) cylinders (4) or gears (0 – it’s a CVT). Rather the digit to remember is 21.7. That’s the number of pounds each horsepower is tasked with carting around in this compact SUV. Cute got a new face for 2017. 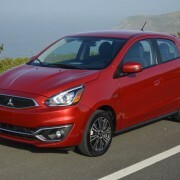 Mitsubishi has grafted new front and rear fascias to their eminently affordable beginner car, the Mirage GT. Up front, new HID Bi-Xenon headlights contain a light tube for signature recognition. The loaded Outlander GT makes a good case for ownership. For starters, the price is right, at a base of just $30,995. Even fully loaded, with a $3,350 Navigation System that also includes Lane Departure Warning and Adaptive Cruise Control, the bottom line tally is a modest $35,195. Although eight years have passed since Mitsubishi last contested the World Rally Championship with the Lancer, this compact sedan still retains its WRC pedigree. With 11 different Lancer combinations available, picking the right one for your needs can be problematic. The range begins with the $16,000, front-wheel-drive DE sedan and tops out with the $35,000 all-wheel-drive GSR Evolution. Now in its third year of production, the Outlander Sport gets a fresh face and rump for 2013, along with larger wheels and new color palette. 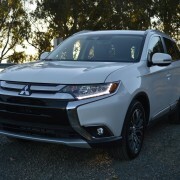 The revised snout and upturned, spoiler-topped tail impart a hunting hound rake to this crossover SUV based on the Lancer chassis. In the SE model, more up market interior trimming than before belies the Sport’s modest $22,295 base price. First of all, let me preface this review with a disclaimer – this will not be an unbiased review that you have come to expect from me. Oh wait. This will be just like all the other passionate reviews you can expect from me. But this one is different.